The Luccia 1.5 Carat Round Trellis Setting Cubic Zirconia Solitaire Engagement Ring in Platinum is inspired by the newest solitaire designs. 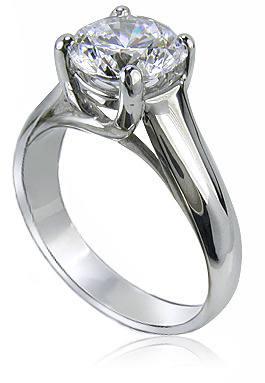 A single 1.5 carat 7.5mm brilliant round is set in this gorgeous solitaire engagement ring. 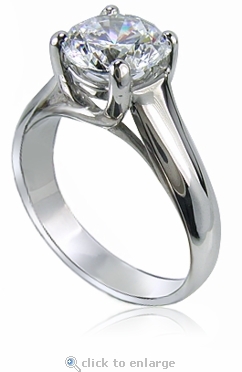 The signature design element featured for this trellis style setting solitaire are the crisscross lattice or trellis styled prongs that beautifully bypass each other to adorn and secure the beautiful round center stone. This ring makes a perfect solitaire for someone who likes a unique take on a traditional look with its softly rounded shank and unique prong setting. This is a great engagement ring that can be coupled with any eternity band, anniversary band or wedding band of your desire. This specially priced solitaire is available in luxurious platinum and select sizes, please see the pull down menu for options. For further assistance, please contact us directly at 1-866-942-6663 or visit us via live chat and speak with a knowledgeable representative.